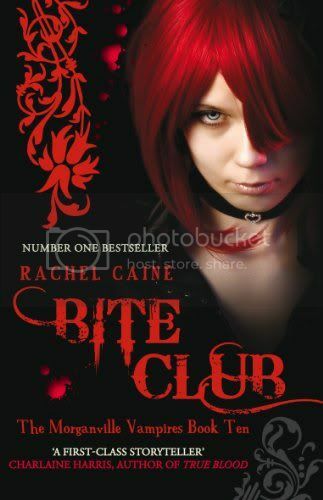 Bite Club by Rachel Caine - WARNING! This is the tenth book in the Morganville Vampires series, and I can't review this book without spoiling the previous books. Do not read any further if you don't want the series spoiled for you. I am such a huge fan of this series, as you all know, that I was expecting to be blown away yet again. And I was because of Caine's amazing ability to come up with a new plot everytime, keep the story unpredictable, and keep her characters so life like! However, I must say, this one disappointed me a little. I have read better books in this series. And this was mainly because, in the greatr scheme of things, not a huge deal happened. Any other series and this wouldn't be a problem for me; I don't need lots happening to enjoy a book, and I did enjoy this one. But I am so used to this series being chock full of action and danger and edge-of-the-seat moments, and that's not really what you get in this book. It was much more of a slow burner, building up to the Big Event rather than being as action packed. Bite Club is more of an emotional novel than the others. Claire is worrying about her relationships with so many people for so many different reasons and she is a very stressed Claire Bear in this book. But I'm not the kind of person who gets all that upset along with the character unless I actually believe things will end horribly wrong, and despite the plot, I didn't. Throughout the whole book, no matter how bad things got, I always had in my head that the characters were far too strong for them to not beat the emotional side of things - hell, they'd come up against worst physical problems. I won't tell you whether I was wrong to believe this or not, you'll just have to read and find out. There was a really, really good thing about this book though. Most of the books in the series are third person perspective following Claire, and Bite Club is the same, but we also get into Shane's head. We get his first person perspective on events that happen in the book just after or just before they happen. How he's feeling, why he's feeling it, what he's going to do, etc. And although it was really cool - hello, inside Shane's head! - it was also completely necessary. Shane plays a much bigger part in this novel than he does in the others; he's always been a main character, but Claire is always the one we're with at all times of the day, but we also get to be with Shane too, even when Claire isn't around, and we need to be. Because things are happening and with both people, and we need both sides of the story to know what's going on. It was pretty awesome, and I really hope to see more of this in the next two books. Eve and Michael get more of a part to play in the next two, perhaps? Overall, still a really good book, and a fantastic story, but not as good as I'm used to. I'd still highly recommend it to any Morganville Vampires fans, but just don't expect stakes to be flying as much as they normal. I discovered Rachel Caine this year with her Weather Warden series. I really enjoyed her writing style, so I have Book 1 of the Morganville series waiting next to my bed for me to dive in. Oooh, I hope you enjoy this series as much as I do! Despite this one being a little disappointing, I'm a huge fan!